Does Winter Give You the Blues? When short, dark days and frigid weather roll around each winter, do you feel yourself wanting to hibernate? Researchers estimate that up to 6% of the U.S. population suffers from Seasonal Affective Disorder (SAD) and 14% more experience the milder form as Winter Blues. Both are types of depression that arise when the seasons change. In Virginia, this means that nearly 1.7 million Virginians could benefit from natural treatments to help them combat depression symptoms that can adversely affect mood, productivity, and attention (US Census estimates). What is Seasonal Affective Disorder and the Winter Blues? Seasonal Affective Disorder is a type of major depressive disorder with a seasonal pattern and the Winter Blues is a less severe form of the condition. It affects women more often than men, those with a family history, those who are younger, and those who already have another diagnosis of depression or bipolar disorder. It is related to changes in the brain chemistry brought on by shorter days and less light, therefore those who live in the Northern United States are often more affected because those areas receive shorter days and less light in the fall and winter. Luckily, symptoms usually abate with the return of spring. The condition can be very severe causing unhappiness, hopelessness, low energy, overeating, sleeping too much, irritability, and difficulty concentrating. Why do people develop Seasonal Affective Disorder? Scientists believe that this type of depression is caused by an imbalance with the neurotransmitter serotonin which is involved in maintaining a positive mood. They also believe that sufferers might overproduce the hormone melatonin, which is involved with sleep and circadian rhythms. Many people with SAD often have deficiency of Vitamin D.
What is the most well-known treatment? Light therapy is one of the most well-known treatments to help people who have Seasonal Affective Disorder but just 60-80% of people may benefit. Light therapy involves sitting in front of very bright light from 30-90 minutes a day to simulate the light levels during the summer time. This type of depression was first identified, along with the light therapy treatment by Norman Rosenthal, a psychiatrist working at the National Institutes of Mental Health (NIMH) 1984. Yes. Neurofeedback therapy has been used to help people train their brains to regulate their own moods, and alleviate or eliminate symptoms from seasonal affective disorder, depression, anxiety, bipolar, and other conditions affecting mood and emotions. Neurofeedback relies on your brain’s neuroplasticity in order to help work more efficiently, eliminating the brain imbalances that can cause depression. First, a brain map is developed to identify where imbalances may be taking place, then customized training protocols are developed to assist you in learning to train your brain. Best of all, the treatment is non-invasive – most patients spend 30 minutes for a set number of weeks watching a video and learning to respond to its visual cues. The results are long-lasting, and can be used safely in combination with any other treatments. Are there other natural treatments that don’t involve medication? Yes. Diet and exercise are well known treatments that can help bolster health and mood. A physician or nutritionist might recommend supplementation with Vitamin D. And, lastly, psychotherapy with a trusted therapist or clinician can also help with depression and Seasonal Affective Disorder. If you or a loved one is suffering from the effects of Seasonal Affective Disorder or the milder Winter Blues, there are many natural strategies that give you a new lease on life. Contact Dr. Ed Carlton from the Carlton NeuroFeedback Center in Manassas, Virginia, to learn more neurofeedback therapy that helps you retrain your brain and release you from depression’s grip. Download our free eBook, and book your free evaluation today! Learn how easy it is to feel better now! 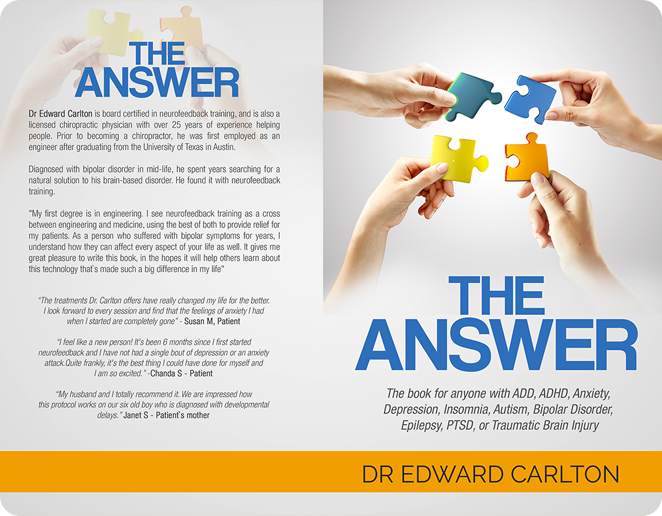 Download Dr. Ed Carlton’s eBook that shares how neurofeedback training works and its benefits. Schedule a Free Evaluation Today! Website Designed & Search Optimization by Intelligent Evolution, Inc.